I have been living in Valparaiso, Chile for almost 2 months now and I am finally starting to settle in to a routine here. When I say routine, I don’t mean the same ordinary schedule on a day to day basis. That’s almost impossible in Chile where new, strange, and wonderful things seem to happen every day. Just today I saw a man walking a pack mule through the middle of the city and a street performer juggling fire in an intersection. 8:30am – Wake up and stay in bed for 5 minutes convincing myself to roll out of my covers and brave the biting chill of my apartment in the morning. It’s winter here and there’s no central heating in my building (and in most buildings in Chile). Instead, Chileans bundle up and drink lots of tea. I’ve learned to adapt quickly. I hop out of bed and scurry to the kitchen to heat up some water. 8:45am – My parents are still in bed and the house is quiet so I make myself breakfast: oatmeal, an apple, and Nescafé® – the national instant coffee of Chile. Long gone are the days of the strong artisanal roasted coffee of the Pacific Northwest. 9:20am – Kiss my parents goodbye (one kiss, or rather a notion of a kiss, on the left cheek – as is custom in Chile) and run out the door to catch la micro (the bus). My first class is 25 mins away in the town next to mine. Unlike in the U.S., Chileans don’t live on their college campus. Instead, commuting is an everyday part of life for students here. 9:25 am – Catch la Micro. This is an event in itself. The buses here have no designated schedule. Instead, its a game of chance. I count on pure luck and hope for an empty bus. This flaky system works surprisingly well as I rarely have to wait more than 10 minutes for my bus. 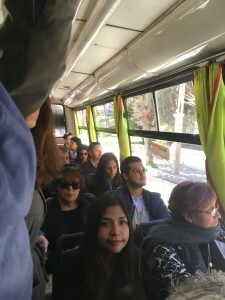 a full bus. With the way the bus drivers whip around corners and come to halting stops, standing on the micro is a full body workout. I literally broke a sweat the last time I did it. 10:05am – 1:15pm – Class (Social Psychology). I attend a Chilean University so all of my classes are taught in Spanish and most are with Chilean students. I am one of three gringas in this class of 30+ Chilean students and the professor takes no pity on us. I only understand about 60% of lecture because she talks so quickly. The Chileans in the class say they can barely keep up. I honestly don’t know what I was thinking signing up for a psychology class in Spanish with absolutely no background in psychology. However, its a great chance to test how much my Spanish is improving. About 6 weeks ago I only understood about 25% of the lecture, so at least that’s something. 1:20pm – Hurry to the closest bus stop to catch la micro. My classes are spread out in buildings across two towns and I only have about 30 minutes to get back to Valparaiso for my next class (to think I used to complain about walking 10 mins across the UPS campus). I hop on the bus. A man gets on at the next stop and shoves a three pack of band-aids into my hand. He returns to the front of the bus to preach about the everyday importance and necessity of band-aids and how we could improve our day-to-day medical preparedness for only 100 pesos. Although compelling, I choose to save my money and continue living recklessly without band-aids. I give them back to him on his way out as he moves on the the next bus. This scenario happens almost everyday. I have heard short, passionate speeches given by bus entreprenuers on everything from nail clippers to books on meditation. 2:10pm – I arrive 10 minutes late to my next class – as I do every Thursday. My professor doesn’t mind. Time in Chile is more or less a suggestion. The whole country generally runs half an hour late. 3:30pm – I buy a big slice of my favorite cake from the school cafe for my walk home. It costs 250 pesos (40¢). I eat half then give the rest to one of the surprisingly fat street dogs on the corner. 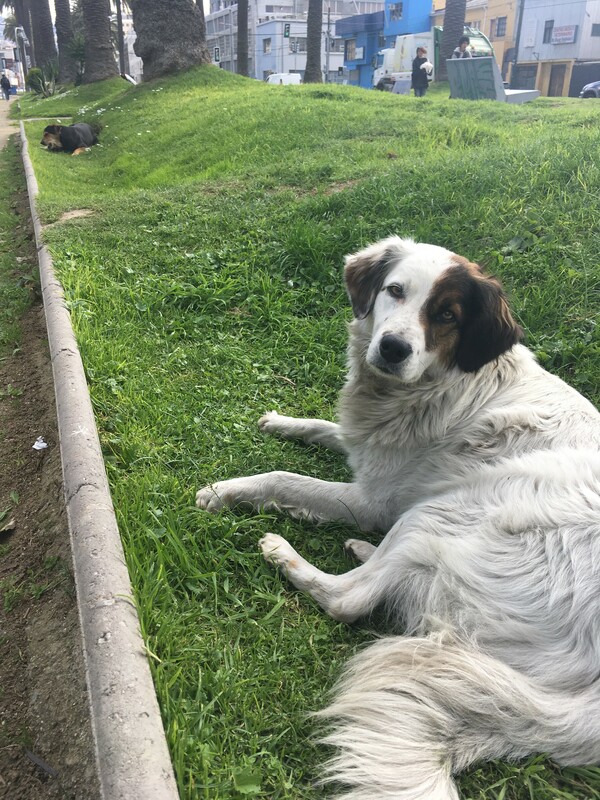 Valparaiso is filled with stray dogs and they are well cared for by the residents here. Its not uncommon to see makeshift dog shelters along the road complete with food and water. The dogs return the favor in their own way. They often accompany me when I’m walking home late from a night out with my friends, or simply let me pet them when I’m having a down day. My walk home is long (about 1 mile). But I don’t mind. 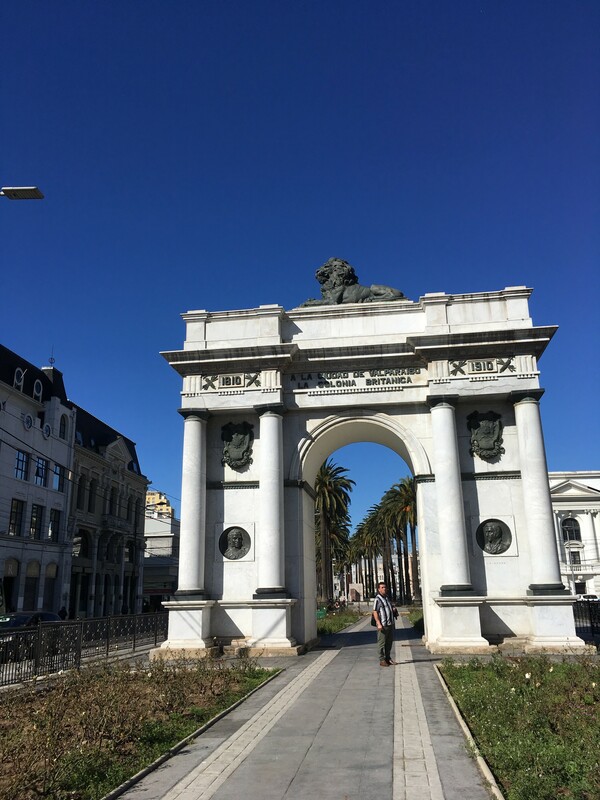 The dogs are cute and the path is beautiful, lined with palm trees and old colonial buildings from the times when Valparaiso was the largest port in South America. 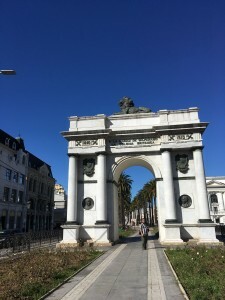 a gift given to Valparaiso from Britain in the early 1900s. I walk by the arch everyday on my way home from school. Oddly enough I have never seen anyone walk under it (including the man in this picture). I have an irrational fear of walking under it myself. 4:00pm – I return to my apartment and eat late lunch with my family. 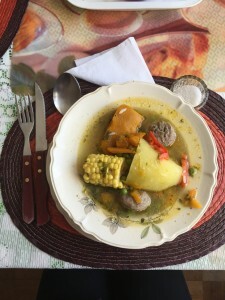 It’s winter so we usually eat soups or stews. Today my mom makes La Casuela: a traditional Chilean stew with meat, corn, pumpkin, potato, various other vegetables and a little pasta. It’s warm, comforting, and reminds me of the wholesome soups my mom used to make me on cold winter days like today. Everyone is there for lunch: my mom (Alicia), my dad (Carlos), my sister (Carolina), my cousin (Patricia), and the housekeeper (Tina). We’re all crammed together at a small table in my parents room. We have a dining room but everyone prefers to eat here for informal family meals. My mom says its more intimate. Plus there’s a TV which we always watch while eating. Chileans love TV. Lunch is long. In general we spend a lot of time at the table throughout the day, talking, laughing, crying, catching up. Family is an important part of Chilean culture so family time makes up a large part of the day. I asked my mom once if Chileans have siesta – she said no, but she takes one anyway. I gladly follow her lead. 6:00pm – I go out to check out the artisan street fair by my house. 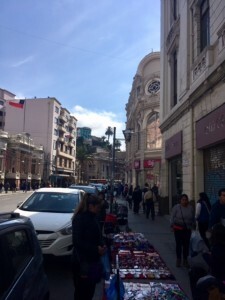 The city streets are constantly lined with street vendors selling everything from kleenex to fresh empanadas. It seems like I can’t walk anywhere without coincidentally shopping on the way. My bank account suffers but my stomach does not. 8:00pm – Once (pronounced: Ohn-say). Once is small meal at the end of the day usually consisting of bread, cheese, meat, jam, and tea. The name once literally translates to “eleven” however we rarely eat that late. My family and I sit down at the same small table in my parents room while watching our favorite Chilean telenovela. Before coming to Chile I was never a fan of melodramatic soap operas. However, after two months of watching them every night I find myself deeply invested in the characters lives and genuinely disappointed when I miss an episode. Again, we spend a lot of time at the table talking and eating. The small plastic table next to my parents bed seems to hold this family together. 10:00pm – My friends invite me out to a Cervecería (alehouse). We drink artisan beer at 2000 pesos/pint (about $3 USD). After, we go get empanadas from a street vendor. By now its past 11pm on a Thursday night and the streets are full of people. For most Chileans, the night is just beginning. It’s typical to stay out past 5am. My friends invite me out dancing but I have an early morning so I decide to head home. 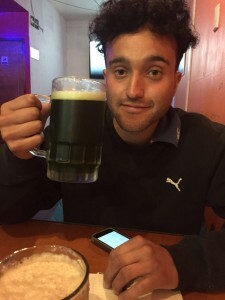 My friend Neto and his beer. Although I may miss the coffee of the PNW, I certainly do not miss the bitter IPAs. I prefer the sweeter, smoother taste of Chilean beer. 12:00pm – I get back to my apartment and hop in bed. I check my phone which says I have walked over seven miles today. In general, I walk a lot more here than I do in the U.S. My first couple weeks here I went to bed with sore legs every night. Walking is a primary form of transportation for Chileans because many don’t own cars, including my family. Before I fall asleep I think about home. I miss it, but at the same time Chile is, in so many ways, my new home. My routine here feels familiar and comfortable and I find myself amazed at how quickly I have adapted to so much new in so little time. I still struggle with the language and cultural barriers everyday, and I know by that there is no way I will ever be fully integrated into Chilean society. But that’s not the reason I came. I came for many reasons, but one of the biggest was push myself out of my comfort zone, to challenge myself to survive amidst a language and culture foreign to me. Now, two months in, I realize that I am comfortable here. Of course the past two months have been filled with ups and downs and incredible difficulties that have challenged me and will continue to challenge me in ways I didn’t know possible. However, despite all of this I have found a sense of home here – a new comfort zone that I didn’t know could exist outside of my life in the States. My family, my friends, my classmates, and even the street dogs have accepted me as their own. The street names, landmarks, and bus lines have become ingrained into my head. The sounds of the language and the feeling of Spanish words rolling off my tongue have become familiar. I have found my routine.